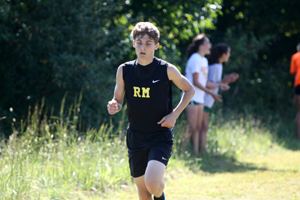 The Richard Montgomery High School boys team and Whitman High School girls team each finished sixth and topped all Montgomery County teams at the 2017 Oatlands Invitational in Leesburg, Virginia. 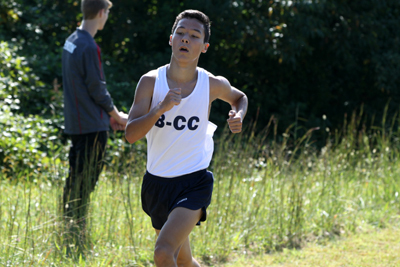 B-CC's Adam Nakasaka was the top Maryland finisher in the boys varsity A race, a fact which he was astutely aware of immediately following the race. Nakasaka was keenly aware of more than just his Maryland competition. He knew very well the loaded field that he was up against including the Footlocker hopefuls from out-of-state. He even knew the general layout and major pitfalls of the course, despite never having raced it himself. B-CC head coach, Chad Young, took no credit for Nakasaka's preparation. "He prepares himself," said Young, explaining that Nakasaka spends considerable time researching all things track on the internet. So when about a dozen runners raced out in front of him in the first mile with times as low as 4:55, he knew not to panic. In fact, he expected it. "I had heard about that [fast start at Oatlands]," said Nakasaka. "But last year we went to Adidas [Adidas Invitational in Cary, NC], and for the first mile there, I ran 4:40. I was prepped for it and I wasn't going to be surprised if that happened, which it did." He added that he saw some guys that he knew, presumably guys that he knew he could catch, in front of him which reaffirmed his decision to hang back in the first mile. Over the next mile and a half, he executed his strategy to move up gradually. He was in sixth place at the base of the large hill at the 2.5 mile mark. After the large hill, he felt like he was slowing down considerably and fading, but nobody passed him. Then in the final stretch, he glanced back and saw someone that he knew to have a pretty good miler's kick: Richard Montgomery's Mark Unger. "I didn't really know where [Unger] was," said Nakasaka. "It was only in the final straightaway that I started to look behind to see who was there. I kind of gave him a couple of glances back and just kept sprinting until the line. I'm surprised by how good he's been so far." Nakasaka's sixth place time of 16:15 ranks eighth all-time by a Montgomery County athlete on the Oatlands course, a course which has not changed much at all over the years. Unger finished seventh in 16:16, RM's Garrett Suhr finished 12th in 16:28, and RM's Joachim El-Masry finished 17th in 16:45. The only other Montgomery County runner in the top twenty or under 17:00 was Whitman's Aaron Bratt who finished 16th in 16:39. RM Head Coach Davy Rogers' message did not change much from last week when Mocorunning interviewed him at the Track and Trail Invitational, which RM won easily. Said Rogers, "It's our five-six-seven, man. That's the difference between us being good and great...That split between our four and five has got to close." That split from number four to five, Rogers pointed out, was 73 seconds, and at Oatlands, that was the difference of 140 places. He said that he knows what they need to do to fix it. Rogers continued, "Our top three ran about where we thought they would. Our fourth, Nick Olano, had an amazing second half of the race...he probably picked up one hundred spots in that second half." "Today we were just trying to go out and see where we're at right now. The first two meets we won pretty easily, but you come here and you got all of the DC area's best competition, so this is really where you get to see where you stack up against the competition from Virginia and DC...You know you're always going to get the best at Oatlands." Like Richard Montgomery, Whitman High School also had success in smaller meets in Maryland before testing their strength at Oatlands in Virginia this week. Whitman swept the boys and girls team titles at the Rebel Invitational at South Hagerstown High School last week, but it took just sixth place in the girls race and seventh place in the boys race at Oatlands today. "What a difference..." said Whitman head coach, Steve Hays, multiple times when comparing a mega-meet like Oatlands to smaller meets in Maryland. "It's a little brutal out here today," Hays said, referring to the weather which climbed into the 80's without much help from clouds or trees to shield the sun on most of the facility grounds, "...and definitely a little bit different from last week." Whitman's girls finished sixth even though top returning runner, Paula Bathalon, dropped out of the race, presumably due to the heat. Hays said that Bathalon was also affected by the heat in Hagerstown where she struggled to finish, so they will work to figure out what is happening. Elizabeth Sklaire (59th) and Emmersen Weinberg (93rd) stepped up to help Whitman today, according to Hays. 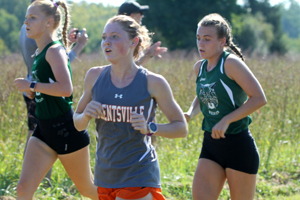 Without two of its top runners, the defending state champion Walter Johnson girls team fell to eighth place in the standings behind Whitman and other teams from Virginia and North Carolina. Sophia Scobell did not race due to injury, according to coaches. Abigail Green was on hand to support her team and said that she "just wasn't ready" to return to racing as she continues to recover from an illness that plagued her this spring and summer. WJ has a new #1 runner in the absence of Green. Sophomore Jenna Goldberg ran with teammate Janet Scott for the entire race and finished nineteenth overall in 20:23. Goldberg, a breakout 3200m runner on the track following her first XC season, was the second overall Montgomery County finisher today. The first overall Montgomery County finisher was Nandini Satsangi of Poolesville who finished tenth in 19:53. According to head coach, Prasad Gerard, Satsangi was in seventh position, but fell somewhere in the final half mile. Defending 3A state champion, Ryan Lockett of Poolesville, finished 68th in 17:42 despite running in good position early in the race. Lockett could not be found for comment following the race. Poolesville head coach, Prasad Gerard, told Mocorunning that Lockett told him that his legs were tired and it was just a bad race. Previously, Lockett fell multiple times at the Brunswick Invitational and trained through two dual meets. Rough season for lockett so far but we just gotta wait till he has a good race to gain some momentum on. Gj to everyone at oatlands though everyone, making Moco proud!